How do micro-organisms influence trees? grow on the surface of leaves. What are ‘close associations with roots’? Other kinds of micro-organisms in the soil have much closer relationships with trees, entering the roots and changing their structure. Yes, close associations with woody plants appear to be widespread throughout the world. The great majority of tropical trees are thought to have at least one such association. improving the uptake of water (C 11, C 13). NOTE: Many soil-improving trees and shrubs, which can reclaim degraded sites (D 22 in Manual 4), have at least two types of special associations with their roots. What kinds of micro-organisms form close associations? But aren't these the things that cause disease? Some species form these special associations, with direct benefits for themselves and their host trees. What do the useful micro-organisms gain? But won't that reduce the growth of my trees? Not necessarily. It is often shortage of nutrients that limits the growth of trees in the tropics, though many other factors may also be involved (D 10–16 in Manual 4). Except where young trees are heavily shaded or unhealthy, plenty of sugars can be available for this ‘trade-off’ with the fungus in exchange for nutrients. The general principles are becoming clearer about close associations with roots (C 62), but so far only a limited amount of research has been done on specific details. Are there names for these associations? Actinorhizas are close associations between actinomycetes and tree roots. Ectomycorrhizas, in which fungal threads form a sheath outside fine rootlets of the tree, and penetrate between the root cells. Arbuscular mycorrhizas (endomycorrhizas, vesicular-arbuscular mycorrhizas or VAMs), where the fungi grow inside the cells of the roots. They occur in the outer part of roots that have not yet thickened and become woody, though not in the conducting cells within (C 10–11). very large numbers of resting spores. 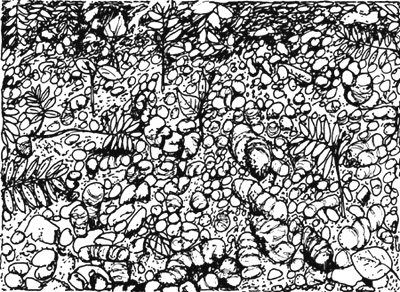 Can you see ectomycorrhizas quite easily? Yes, they can usually be spotted with the naked eye or a hand lens. Ectomycorrhizal rootlets are often short and relatively, thick with blunt ends. Most of the fungi involved form large fruiting bodies (‘mushrooms’) that are easily seen at certain times of year, though connection to a tree is difficult to establish. Is it harder to see the arbuscular mycorrhizas? Yes it is, for they cannot be seen with a hand lens, nor do the fungi involved form large fruiting bodies. However, infected roots are very common, and can be detected by using a simple staining technique and then looking at samples under a microscope. How do mycorrhizas benefit the tree? Through nutrients and probably water being passed to it from the fungus. But surely a tiny fungus can't help the growth of a big tree! some ectomycorrhizal fungi can break down, absorb and pass on nutrients from the soil that otherwise are unavailable to tree roots. In fact, these fungi may be so important that some trees cannot thrive without them (C 31, C 60), and mycorrhizas can even form a substantial part of the root systems of some tropical trees. Equally, many of the fungi cannot thrive without the trees. Which nutrients are passed to tropical trees by mycorrhizas? Many kinds of nutrients are probably transferred, but phosphorus is especially important. This is one of the three elements needed in large amounts by trees (C 14), but in tropical soils it is often scarce or locked away in an unavailable form. How can mycorrhizal fungi utilise ‘unavailable’ nutrients? Some ectomycorrhizal fungi produce special enzymes (C 14) that can break down resistant organic substances in the litter or soil, which other decomposers cannot do. These are modified, roundish bodies on the roots, a few mm in diameter, in which large numbers of bacteria occur. Such nodules are easily seen and are well known on the roots of leguminous crop plants like beans and groundnuts. They also occur on many (though not all) leguminous trees, particularly those in the families Mimosaceae and Papilionaceae (C 32, C 62-D). Which nutrient are they mainly involved with? Nitrogen - the nutrient required in largest quantities by plants (C 14), but often readily lost and not freely available in tropical soils. How do the bacteria help? Nitrogen gas forms about 80% of the atmosphere, but in this form it is unavailable to plants. However, bacteria belonging to the group called rhizobia are able to turn nitrogen gas into soluble nutrients. These nitrogen-fixing micro-organisms can therefore add to the total amount of nitrogen that is available. Can trees get hold of this extra nitrogen easily? indirectly when nodules decay, so that the nutrients are released into the soil by decomposers and can then be absorbed by the tree's roots. So you get a free fertiliser! Yes, that's right. This is one of several reasons for planting mixtures of different species (D 30, D 53 in Manual 4). If nitrogen-fixers are included, the total amount of nitrogen that is cycling in the ecosystem is increased, which means that other trees and crops without root nodules may grow better, especially on poor soils. Is that especially true of soil-improvers? Most of these species, besides having nitrogen-fixing root nodules and mycorrhizas, are quick-growing colonisers that can become established on open or degraded land (D 22, D 32 in Manual 4). Some examples with confirmed nitrogen-fixing ability are associations with Calliandra calothyrsus, Gliricidia sepium, Inga jinicuil, Mimosa scabrella, Leucaena leucocephala, Sesbania grandiflora and species of Acacia, Albizia and Erythrina. These occur as root nodules on the roots of soil-improving trees such as Alnus, Casuarina, Allocasuarina and Coriaria. The micro-organisms belong to a kind called Frankia, and like rhizobia they help the tree to acquire nitrogen. Research has shown that effective formation of nodules can vary considerably from one provenance of a tree species to another (C 5). What have mycorrhizas got to do with tree nurseries? A good nursery root system is one of the keys to growing and planting trees successfully (C 4, C 11, C 34). If the root systems of the planting stock are already mycorrhizal, the young trees are likely to establish better. Which kinds of tropical trees produce ectomycorrhizas? All dipterocarps, for example Dipterocarpus, Hopea and Shorea. A few other broadleaved trees, including some eucalypts and oaks. And which trees form arbuscular mycorrhizas? Around 95% of all tropical forest trees are thought to do so. A few species of Acacia, Afzelia, Eucalyptus, Hopea and Intsia can even form both types of mycorrhiza. Are there some groups of trees that don't form mycorrhizas? It is thought that trees in the families Lecythidaceae, Proteaceae and Sapotaceae do not do so. Does it matter which fungus forms the mycorrhiza? It often seems to make quite a lot of difference, because particular species of fungi appear to be associated with certain groups of tree species. For example, ectomycorrhizas formed by the fungus Pisolithus tinctorius and the conifer Pinus caribaea have been studied by several workers (see Lapeyrie and Högberg, 1994 in C 62-C). In ectomycorrhizas, different groups of fungi appear to be involved as the tree gets older. Is there much variation within one kind of fungus? Yes, there can be. Some strains of a fungus may form more effective mycorrhizas than others, just like some clones of trees make better growth (A 11 in Manual 1). There is some evidence that a specific strain of a fungus might combine particularly well with a particular tree clone. Can I tell which kinds of fungi are present? Mats of threads can sometimes be seen amongst wet litter or in the topsoil, but these could belong to non-mycorrhizal fungi, and are too fragile to trace far. Identifying the fungal species in the soil or the tree roots is possible, but it requires detailed microscopic study of roots, threads and spores, and sometimes the culture of individual fungi in the laboratory. So it's not much use to me! estimate the frequency of infection of roots with mycorrhizas. But how can I make use of that? might make a substantial difference to their performance. How is infection with ectomycorrhizas detected and assessed? checking under the microscope for the presence of the network of fungal threads covering the rootlets. And what about arbuscular mycorrhizas? Infection is checked by collecting samples of fine roots, treating them with a clearing agent that makes it possible to look through them, and using a coloured stain to show up the fungal cells. The proportion of roots containing fungus can then be estimated under a microscope. What does one use to inoculate the root systems of trees? spores or pieces of the fruiting bodies producing them, or cultures of kinds of fungi that have been shown to make effective ectomycorrhizas with the tree species. soil cultures of an arbuscular mycorrhizal fungus. For instance, strains of Glomus are beginning to become available. Source (3), where available, is likely to prove the best way of obtaining ectomycorrhizas that can improve tree establishment, reliably and substantially. Source (4) - simple methods have been developed for multiplying the quantities of inoculum for arbuscular mycorrhizas. These consist of growing crop plants such as cowpea, millet, sorghum or maize for a few months in a sterilised (C 44–45) and inoculated potting mix in large containers. These enriched soil cultures can then be added to soil mixes as required. Note: national regulations and international certificates govern the import of soil and roots from one country to another, because of the dangers of transferring pests and diseases. Inoculating soil with spores from the fruiting bodies of ectomycorrhizal fungi. Isn't it hard to inoculate the young trees? No. One just mixes a small amount of the inoculum into the topsoil of seed-beds (C 23) or with the soil mix used to fill seed trays or pots (C 6, C 42). Failing this, it is possible to put a little inoculum into the hole when a tree is planted in the field (Manual 5). Which method is likely to be best? Ideally, one would inoculate the germination or potting soil with a mixture of known strains of fungi. Then the young seedlings or rooted cuttings should form particularly effective mycorrhizas early in life, before they are exposed to the extra stresses of hardening (C 47), transport, planting, competition and browsing. How would I know that inoculation had done anything? By doing a small experiment (C 7, C 15) in which you potted up comparable plants in the same soil mix, with and without a fungal inoculation of about 5% by volume. Both sets would need labelling (C 54) and looking after carefully (C 40, C 48). For the layout, you could keep the two treatments in similar conditions near to each other, though not so close that spores could easily be transferred by water splashing on to the soil. Similarly, the containers could be raised clear of the ground to prevent seepage of water from pot to pot. If the results were positive, you might do a more detailed experiment to compare several sources. How big a difference can mycorrhizas make? For ectomycorrhizas, introductions of pines, cypresses and other species into new areas have sometimes failed (C 60) without a first inoculation of nursery or forest soil from the country of origin, followed by transfer of infected soil from nursery to nursery. Increased growth of inoculated pines has also been found in several trials during the first 1–2 years after planting. For arbuscular mycorrhizas, a suitable local fungus may more often be available, though inoculation can often still be beneficial. For example, in establishment trials with Terminalia prunioides in Kenya more than twice the number of plants given a mixed inoculation in the nursery survived through the first long dry season than in the uninoculated controls. What other trees have been studied? shrubs such as cassava (Manihot esculenta). Arbuscular mycorrhizal inoculation is standard nursery practice for large Citrus plantations in some countries, but more research will be needed before this stage can be reached with other tropical tree species. When is inoculation especially needed? site preparation is to be done with heavy machinery (particularly if the surface soil is likely to be compacted, broken up or buried). In all these cases the right kinds of mycorrhizal fungi may be absent or in short supply. Their growth and spread are usually interrupted by the removal of many trees, which exposes and disturbs the soil. Other fungi, associated for instance with persistent weeds, may have become common. Planting introduced colonisers (D 14, D 32 in Manual 4) could help local species to regenerate naturally (D 2 in Manual 4), by restoring numbers of arbuscular mycorrhizal fungi. When would inoculation be less important? If wildings (C 2) are collected with some of the local soil, especially directly under the seed tree. It has been found that naturally regenerating seedlings can even be sustained in dark, dry and nutrient-poor conditions through ectomycorrhizal ‘bridges’ with the parent tree. How long can I keep the inoculum? nursery soil infected with arbuscular mycorrhizas can be multiplied repeatedly to provide inoculum. What should I do if I run into problems with mycorrhizas? Do any nursery procedures affect mycorrhizas? Soil sterilisation: sterilising the nursery soil generally kills all the beneficial mycorrhizal fungi and decomposers as well as any disease-causing agents, insect pests and weed seeds (C 44–45). So if the soil should need to be sterilised (by heating or by chemicals), inoculation with mycorrhizal fungi might well be needed afterwards. Fertilisers: use sparingly or not at all (C 33), or you may reduce the likelihood of successful mycorrhizas forming, or of those that do being effective. Restoring degraded land with a pure stand of a soil-improving tree, Acacia mangium. They are modifications to some of the fine roots of a tree, in which closely associated micro-organisms live. Generally these are bacteria called rhizobia, or sometimes actinomycetes called Frankia. Both of them have the ability to change atmospheric nitrogen into available nutrient form (C 30). Aren't root nodules found mainly in annual crop plants? They have been widely studied in legumes such as groundnuts and soybean, and in temperate zone grazing and crop plants. However, there are 18,000 or so leguminous species, most of which are trees, many of them tropical species. Which kinds of trees have nodules? Leguminous trees: current research suggests that 90% or more of the hundreds of genera of tropical trees in the Mimosaceae and Papilionaceae may be found to have root nodules that fix nitrogen. However, less than a quarter of trees in the Caesalpiniaceae may do so, though in Chamaecrista, for instance, effective nodulation is the rule. Non-leguminous trees: a few genera are known, including Casuarina and Parasponia. Are those used in agroforestry nitrogen-fixers? Many of them. For instance Egli and Kalinganire (1988) (C 61-D) list the following for Rwanda: Acacia albida, A. sieberiana, Albizia chinensis, A. lebbek, Calliandra calothyrsus, Leucaena leucocephala, Pithecellobium dulce and Prosopis chilensis in the Mimosaceae; Cajanus cajan, Erythrina abyssinica, Gliricidia sepium, Sesbania sesban and Tephrosia vogelii in the Papilionaceae; with Alnus acuminata and A. nepalensis nodulating with Frankia. Which legume trees don't form nodules? Papilionaceae: Vatairea, Vataireopsis and Brazilian Pterocarpus. So are leguminous trees specially important? improving the general soil fertility in nurseries (C 23) when used as hedges (C 46), shade trees (C 41) or windbreaks (C 25; and D 41 in Manual 4). Does the planting stock itself need root nodules? the trees are being well looked after (C 40). Research suggests that both the nitrogen content and the growth rates of nursery trees can be increased by root nodules. How about when the young trees are planted out? Already having effective nodules should add to the likelihood of planting stock surviving and establishing well. Such trees might grow well even in poor sites, and could soon contribute to the growth and yields of other trees and crops. Is it easy to tell whether a tree has nodules? might be found only at certain times of year. Do young trees need to be inoculated? as with mycorrhizas (C 31), there may not be inoculum in the local soil that will prove effective with introduced trees and shrubs. For instance, inoculating with rhizobia has been recommended for Albizia lebbek, Pithecellobium dulce and Prosopis chilensis. Adding certain strains of Frankia to potting mixes in the nursery trebled the wood production of Casuarina trees in the field (See Reddell et al., 1989 in C 62-D). What is the best source of inoculum? if available, using strains that are recommended for the particular tree species (already developed for Leucaena and certain species of Acacia). How does one do the inoculation? dusting seeds with a very small amount of powdered inoculum. What about doing an experiment? the same potting mixture + an inoculum of soil from under a different, local leguminous tree species. You might use 15–20 pots for each treatment, giving a total of 60–80 pots. Keep these under similar growing conditions, but slightly apart from each other and raised off the ground to reduce the risk of spreading bacteria from one treatment to another. Avoid fertilisers or a very rich potting mix. Do trees vary much within a species in nodule formation? Yes, this seems to be likely. Considerable variation has been recorded between different provenances (C 5; and Manual 2); and also within a provenance. So, if clonal cuttings are available (A 11 in Manual 1), these might be the best experimental plants. Can trees have root nodules and mycorrhizas? nitrogen fixation may be restricted. It is likely that the phosphorus collected by the mycorrhizas allows normal production and functioning of the nodules. A (above) - bare soil in degraded farmland. B (below) - soil restored 18 months after direct sowing of Leucaena. Why do wastes have anything to do with tree nurseries? shade and shelter for young trees (C 41). Waste water and rainfall can also be collected or encouraged to remain in the nursery soil (C 24) rather than quickly disappearing by evaporation or run-off. What sort of old containers could be useful? 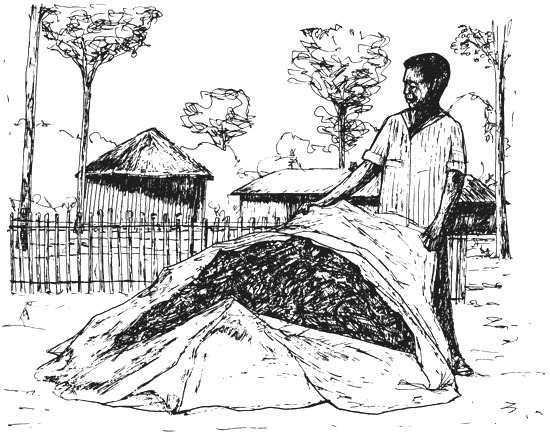 used fertiliser or other large polythene bags, for purposes like storing soil mixes or carrying plants. Which waste materials can go into soil mixes and rooting media? Composts, prepared in the nursery out of most kinds of plant and animal waste, can be the most valuable of all additions. What can be used to improve the nursery soil? putting on a mulch when a particular bed is not in use. Fresh sawdust might be used to build up a wet, low-lying part of the nursery (C 23). Mulching a bed when plants are removed. How should a mulch be made? Various kinds of soil covering can be used (see Goor and Barney, 1968 in C 61-A; and Manual 5), including cut grass, other kinds of leaves, sawdust, bark chippings or pieces of black polythene sheet. 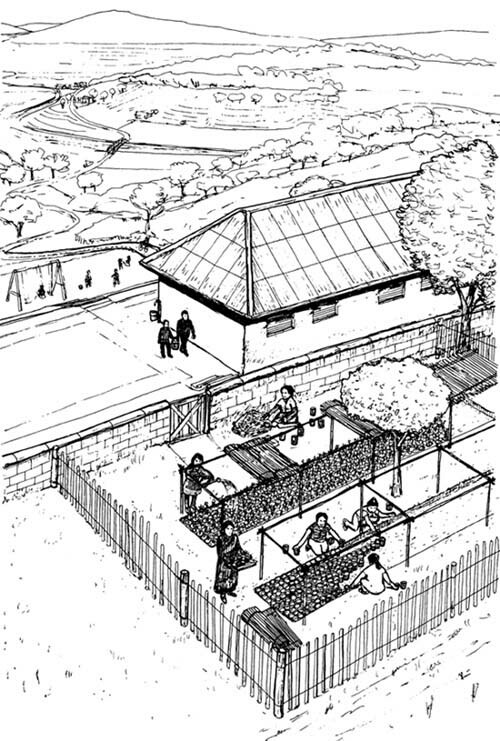 Which wastes are useful for shade and shelter? Cut poles and palm fronds, banana leaves or tall grasses could be useful to put up low or high shade over young trees (C 41). Pieces of strong clear or white polythene sheeting from the covers of furniture and bedding are often suitable for building poly-propagators (A 31 in Manual 1), or protecting delicate seedlings from rain and wind (C 41). Might some wastes be harmful? water that contains a lot of nutrients and is full of bacteria or algae. Is there anything that can be done about these things? Water can be cleaned by running it through gravel or sand. They are made by mixing together plant and perhaps animal wastes to rot, in a pile, a large container or a pit (say 1.5 m deep). The heat given off by the micro-organisms which break down these organic wastes can make the compost hot enough to kill some weed seeds, spores and insect eggs. How does one make a good compost? turn it over from time to time, especially if it becomes very wet. More details can be found in GTZ (1976) and Napier and Robbins (1989) in sheet C 61-A). When is a compost particularly valuable? alternative materials are unavailable, too distant or too expensive. For any nursery, compost is a simple way of replacing some of the continual outflow of nutrients in planting stock. Does a mulch do that as well? reducing the deposition of silt on nursery paths and roads. Mulch is also very useful when young trees have just been planted out (Manual 5). Wouldn't mulching encourage young seedlings to rot? the mulch contained a lot of spores of the damping-off fungus (C 45). the mulch was lifted to aerate it after heavy showers. Wouldn't it be simpler just to add fertilisers? depend on external inputs, rather than sustainable management by recycling existing nutrients. But surely fertilisers might be needed to get good growth! ending up contaminating water supplies (C 24). What would be good reasons to add fertilisers? research trees, to maintain good, uniform growth (C 7) or as treatments in experiments (C 15). Which ways can they be applied? As a foliar feed of very dilute micro-nutrients (C 14), sprayed on the foliage. Whichever method is used, the fertilisers should be balanced (C 14) and not too rich in nitrogen (C 34). How much fertiliser should I add? Dissolved in water: 30–50 milligrams of fertiliser in 10–25 ml water per container (or 3–5 g/l in a watering can), washed off the leaves immediately afterwards. How do I find out what suits my conditions? Further information on fertilisers can be found in Carter (1987), Goor and Barney (1968), GTZ (1976) and Pancel (1993) in C 61-A, and from local manuals. If you think that fertilisers might be beneficial in your nursery you could do an experiment (C 15), in which for instance you might compare adding 0, 10, 25 and 62.5 g NPK per m2. Sample results: average gain in height of experimental trees after 6 weeks. When should I not use fertilisers? just before planting out, because this would stimulate rapid shoot growth at an inappropriate time (C 34, C 47). Are there some cheaper substitutes for commercial fertilisers? for potassium: ash from recent wood or charcoal fires. potassium as a top dressing. For potting mixtures, an appropriate NPK supplement could be added where needed. How big should I grow my nursery trees? what will be the climate, terrain and soil type of the planting site (D 11–12 in Manual 4), and what other plants will be growing there (D 14). Do I want the maximum possible growth? in certain types of experiment (C 15), when studying the potential for rapid growth. For enrichment planting of woodland (D 24 in Manual 4) with trees such as Pterocarpus, success has been achieved in India by growing nursery trees rapidly in very rich soil in large containers, and planting them when 3–4 m tall. Are there any general guide-lines? In most cases, bigger doesn't necessarily mean better planting stock. Root systems need to be more extensive than shoot systems (C 4). The greater the likely climatic stress (C 41) after planting, the better the quality of the young trees needs to be. Why should there be more roots than shoots? unless the roots can deliver enough water to prevent severe water stress in the shoot (C 13), the newly planted tree will suffer a severe check to growth, shrivelling of leaves, die-back of shoot tips or death. How can I control tree size in the nursery? discouraging roots from growing out of containers, and root pruning young trees growing in beds (C 4). Can't I alter the size just before planting? breaking or chopping off some of the root system. Yes it is, particularly reducing the root system just then, for it is the key to successful establishment (C 4, C 11). Aim instead to control the way roots grow in the nursery rather than having to do a ‘hacking’ job at planting time. Nevertheless, some commonly used types of planting stock do involve considerable pruning at the last minute (C 47). What constitutes a good nursery root system? soon being able to support new shoot growth. Is it mainly a question of size? too large, the tree may be difficult to plant properly (Manual 5). In general, the root system should be as big as can easily be planted well. What else is important about the roots? The type of roots present is as important as the size of the root system. fairly straight roots, instead of ones that go round and round the inside of a container (C 6). Inoculation with closely associated micro-organisms (C 30–32) may also make a considerable difference to how well a root system gets established. But how can I know what is going on? By looking at some root systems when the trees are being potted or transplanted (C 42). Do I need to prune the roots back at this stage? raise them clear of the ground on wire mesh or boards. What else could I do if the roots aren't as I want them? amounts of shade, and rates of reducing it (C 41, C 47). Won't all that mean a lot of work? do a formal experiment looking at various possible modifications (C 7, C 15). It is worth a good deal of effort to find ways of growing really good planting stock. How big should the shoot system be? Not too thin and spindly, or the plants may fall over and be blown about in the wind. A sturdy, shortish shoot system may often be the best, even when there are weed problems in the planting site (Manual 5). be more liable to get damaged. experience has shown that they can be valuable on a particular species. And what about the buds and branches? a bushy shoot habit is desired. In species which grow by flushes, it is preferable for the buds to be inactive or growing slowly when the trees are planted out. Does the main stem need to be straight? plants for hedges (C 46) or shelterbelts (D 41). How can I keep the leader straight? trimming back all but one replacement branch after damage. What other things influence the balance between roots and shoots? Overhead shade: young trees kept in very heavy shade tend to have elongated stems and a poor root system. Closely associated micro-organisms that form mycorrhizas or nodules (C 30–32) may in some cases mean that the tree's shoot system is relatively larger than its actual root tissue.